You can’t go wrong when choosing pearls to compliment any outfit. They are classic but also delicate, meaning they require special care and can’t be treated like any other jewelry in your wardrobe. A symbol of purity, pearls can make anyone look radiant but be prepared to maintain them with proper cleaning and storage so they retain their natural luster. Dirt and oil can quickly build up on your pearls, so knowing how to properly clean them is a must. Follow these steps to help them keep their beauty without accidentally hurting their shine and color. After every wear, wipe them with a clean cloth. Choosing a soft, cotton material for cleaning is important to prevent any scratches. 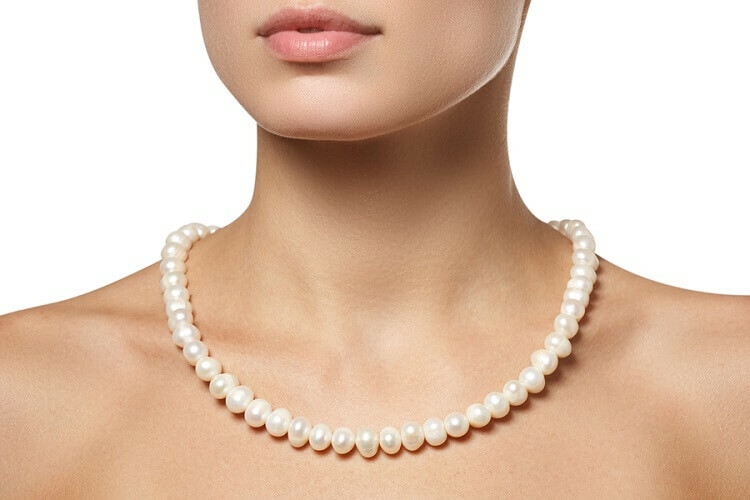 This will help remove oil buildup and other substances that come in contact with the pearls while you are wearing them. Use a damp cloth only when necessary. If your pearls become visibly stained, use a solution of lukewarm water and mild dish soap. Dip a soft cloth in the solution and wipe the pearls gently. However, never submerge them in water as it will weaken the silk thread. After cleaning with this solution, wipe them with a damp cloth to get all of the soap off so they don’t lose any luster. Let them dry thoroughly before storing to help preserve the silk thread. Avoid using jewelry cleaner unless it specifically states that it can be used for pearls. Take pearls to your jeweler once a year and ask the jeweler to check the integrity of the strand. A jeweler can also give them a safe and thorough cleaning. You may enjoy letting many of your beautiful necklaces and other jewelry pieces hang on display, but pearls require a much different storage solution. Create a space where your pearls can lay flat, which keeps the thread from stretching out. This dedicated space should be a fabric-lined compartment that will keep the pearls protected from scratches. You should even get in the habit of closing the clasp before putting them away so the metal doesn’t accidentally come in contact and scratch one of the pearls. Most importantly, your pearls need to breathe. Do not use an air-tight storage area and do not keep them wrapped tightly in a plastic bag. To help prevent your pearls from changing color, store them in an area where the air has a little moisture and gentle circulation. Wear them often to help them stay moist and lustrous. They need to remain hydrated to keep their shine, and wearing them often will prevent them from drying out. Pearls should be your last item on and first item off. Put them on as your final touch after getting ready. They are alkaline so any contact with acids such as hairspray, lotions, cosmetics and perfumes can damage them. One final step in their care and protection might actually be the first thing you should consider – protect your precious pearls with jewelry insurance. Your jewelry is unique and so is Lavalier’s insurance coverage. Trust Lavalier to protect what matters most to you and contact us today to get a personalized quote. How to Clean Pearls Safely and Avoid Ruining Them. www.thepearlsource.com. (accessed Mar 20 2019).